Varies from a small coarse shrub to a small tree up to 10 metres high; most commonly shrubby, with several spreading trunks. Oval-shaped, broadest below the middle, slightly tapered towards a blunt or sharp tip; 2 to 5 centimetres long. The edges are thin, doubly-toothed. The leaf surfaces are shiny, yellowish-green above and paler, dotted with fine glands underneath. Tiny, hairy nutlets with wings broader than the seed. 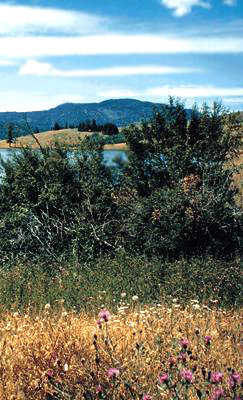 Thousands of seeds are produced from each tree. 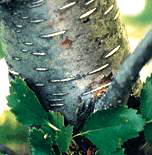 Thin, shiny, dark reddish-brown to black, with marked horizontal slits (lenticels); does not peel like other birches. It occurs frequently in southern British Columbia, east of the Coast and Cascade mountains; rarely found in the north or in mountainous areas. Water birch occurs on the wet to moist, nutrient-rich soils of streambanks, forests, and marshes. It is important in wetland ecosystems and those near water, where it provides important habitat for many birds and other animals. 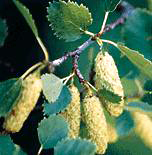 The scientific name Betula is the ancient Latin name for the genus.